I ordered for my high school age son. It was an interesting looking watch but much larger and shinier than I expected. Maybe consider it you want something that really stands out. 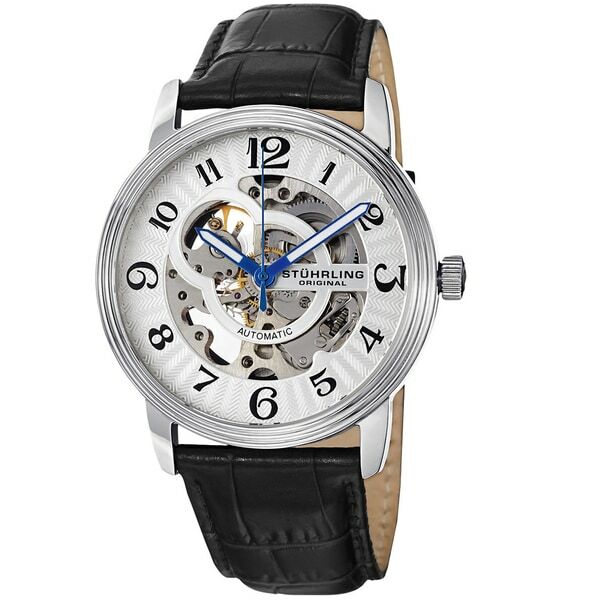 This masculine watch from Stuhrling features a stainless steel case and a black crocodile embossed leather strap. The automatic movement inside this skeleton watch makes it an amazing timepiece. The colors of the Othello hardly clash with anything you wear, so you really dont have to worry about coordinating, and if you didnt worry about to begin with, all this means is that now you wont look like an idiot to other people when you dont match b/c this thing looks great at all times. The larger size of the actual watch is a nice look, and I was expecting to adapt to a gigantic watch and learn to love it, but this thing really isnt so big. I have small to average sized wrists at 6 1/2 inches--a measurement accruately made with an elastic tape measure. If you add 1/2 inch of leeway to that, I'm still only at 7 inches, maybe slightly more, yet this watch still fits and does not look ridiculous. I tighten the watch on the second to last hole and it in no way surpasses the width of my wrist. The circumference leaves about 1/4th of an inch each side. Though, I do not in particular love the elastic band, it is nothing that aesthetically destroys the look of this baby. Also, my purchase was made at an amazingly cheap price! What a sweet deal indeed. Great work stuhrling. This review is for the Stührling Original Men's Othello Classic Automatic, also know as the Classic Delphi Oracle (107BG.33152) I've owned this watch for about a month, and I think it's a good value for an inexpensive watch. Don't expect fit and finish quality of a watch that costs hundreds or thousands.. You get what you pay for. Pros: * The fit and finish of the watch are nice for this price Range * The blue and white hands and large numbers make for excellent readability * The skeleton movement is fascinating * Not too loud, not too quiet. I can hear it ticking on my wrist in a quiet room, but cannot hear it on the dresser across a quiet room at night. * I love the retro-script font of the dial numbers * The embossed finish of the watch face is elegant and decorative * Accurate enough. Mine runs fast by less than 15 seconds per day when I am wearing it, which is expected. * Nice packaging Cons: * It's big, but not too big. I measured mine with a caliper: 44.2mm diameter, 13.4mm thick. On my 7" circumference wrist, a 44mm dial is about the limit for me. At 13.4mm thick, it just fits under the cuff of a dress shirt. Also, at 7" circumference, I use the second-to-last hole in the watchband to fit the watch snugly on my wrist. * The watch "crystal" is mineral glass (aka Krysterna?). Not very scratch resistant for the long term. * the watch band is very stiff. I'm expecting it will soften up with time. * The reported long-term reliability of this movement is variable. Some have had good experience, others have not. Sturhling calls this movement the ST-90050 Manual/Self-Winding Automatic Movement, which is likely the same as the G3202Z made by the PTS-Liaocheng company in China. Stührling offers a 2-year warranty, but charges twenty bucks for any returned watch. Given this, I purchased an aftermarket extended warranty for twelve bucks that covers everything. Overall, I really like this watch and recommend it to anyone looking for an inexpensive mechanical skeleton watch or gift. But your expectations need to be in line with reality. I picked this up for less than seventy bones. That makes this a fantastic value. It's an interesting casual watch, conversation piece, and work of art. It looks more expensive than it is. With a name like Stuhrling Othello what could be more inviting! Honestly, I only purchased this watch because I had a great coupon value to make a purchase at Overstock.com; I noticed the Stuhrling Othello Watch and liked the "clean" looking dial with number displays largest enough to read - it is actually far better looking in person than on the website. More importantly, however, the watch featured an Automatic/Mechanical Movement; personally, I dislike Quartz Watches, because far too often the battery runs out of power at the worst possible times. The Black Embossed Leather Band is excellent; however, it is not a clasp but rather a traditional buckle type. The Hour, Minutes, and Second time hands are beautifully accented with a royal blue and this makes the time easy to read. I have watches that cost considerably more than this Stuhrling Othello, but this is just an excellent deal in price and in quality, and, more importantly, if you are looking for a wonderful, clean, and simple Automatic/Mechanical Movement Watch, then you will not be disappointed. Thank you Overstock.com! This is a fantastic watch that is a great deal at this price (and would be at twice the price). It's simple, with no complications, but that simplicity has a nice benefit in that you don't really need to buy a winder since it's so easy to set the solitary function if the power reserve runs out. Most of the complaints I read about the Othello before purchasing it made reference to how it didn't keep time very well, losing or gaining up to 15 minutes in a day. I've seen nothing like this happen with mine - even wearing it three consecutive days shows the time to be consistent to the minute all the while. The band is top-notch, and the skeleton face looks incredible. If there is anything negative to say about it, the case is a little bit on the big side (but some people like that, and I have small wrists), and the blue hands are a little inconsistent with the general look of the face, but I'd still strongly recommend this piece to anyone who is considering buying it. Watch breaks after 4 months!! I buy watches on a regular bases and usually give watches as gifts. I decided to buy 3 different style automatic Stuhrling watches to give as gifts and was surprised when all 3 had something that broke on them. The ladies one had the hands come off, one of the Men's watches had the clasp break and the last one is OK. 2 out of 3 watches breaking in less than 4 months makes me believe these watches are of poor quality. this watch is an automatic; which means after you wind the watch for it to function it automatically winds based on its movement on the body. 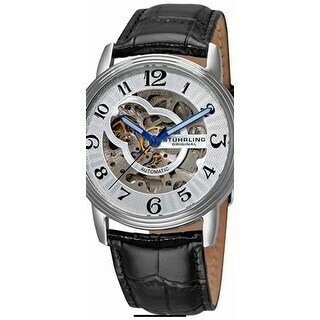 if you are looking for an automatic watch that has dials and hands that are easy to read this is more than likely the best option in its price range.an automatic watch which has no electronic components keeps track of time mechanically and because of this it is probably best to have experienced the movement of time as monitored by an automatic watch at least once in your life time.i was pleased with the shipping the packaging and stuhrlings packaging as well.the watch box opens like it was a piece of numbered jewelry.i searched for an automatic watch after my recent quarts watch ceased to function properly after 5 years. i am pleased i found an automatic watch that is in arabic numerals and easy to read; plus im equally excited to experience how times functions are entirely different when in contrast to the monitoring of time via mechanics and not electronics: i have never owned an automatic watch so this was a surprise. the only reason why i would not recommend this watch is because its rude and unfashionable to recommend something you value to another person. This watch is great in every detail. All stainless steel and a thick leather band. I am glad it has a long band as it just fits. You get a LOT for your dollar! Overstock is always the place to go for the best deals on quality watches. I bought this watch about a month ago and was very surprised at the quality and craftsmanship that went in to such a low price piece. My best friend and his girlfriend recently purchased two Stuhrling originals from overstock at great prices so I decided to check them out. The specs on this watch are a little off. The strap is actually a 24mm. I upgraded mine with a rubber F1 strap with deployment clasp from Modena Watch.com. This watch paired with that strap look amazing. I wasn't too thrilled with the offset winding knob but with a face this large, it makes the watch more comfortable when bending your wrist so it isn't grinding into your hand. I highly recommend this watch! You will love it. Especially for the price. This is definitely a beautiful timepiece. It so looks great added to my collection of watches. The leather band is soft and the box it comes in is stunning, it looks like a $500 dollar timepiece all day long. For the price, what a deal! I purchased this watch for my husband for Christmas. We were both very pleased with the appearance of the watch. It is a beautiful piece. However, he has only been wearing it for less than 24 hours and after the first 12 hours it gained 15 minutes in time. After resetting it, it has lost almost 10 minutes in one hour. One would surmise that if it were the battery it would not have gained time in the first 12 hours. We are returning the watch. Nice looking watch unfortunately stopped working after a 6 months. Self winding didn't work at all. Had to rewind watch every day. I've owned this watch for about 4 months and it's already broken. The automatic components stopped functioning. I am extremely disappointed. Bought this for Boyfriend and he loves it. Looks very expensive. The skeleton view of the dials is really cool and makes for a great conversation piece. This watch was a gift. I find the skeleton styles very attractive, and so did the recipient. He was very pleased, and recalled that his dad wore a sturling watch many years ago. The gift choice was a home run. I absolutely love this watch. i am a woman but i prefer men's watched. It is a little big on me ( i am a small) however it still looks wonderful. its nice to see parts of the watch move. what i love the most is that it can go with any outfit. it looks professional, casual, business, chick all at the same time. price is great. My father liked the first watch we bought him so much that we bought him a second one with a different colored band. A great gift for someone who’s hard to buy for. And for someone who loves and collects watches. I have owned this for 9 years and it still looks great. In that time I sent it back twice for repair and the company was great about fixing. It doesn't keep great time now but I still wear it as a show piece. My husband love this watch! This is a quality timepiece. Keeps accurate time. I've gotten many compliments. Unfortunately, I dropped it and broke the face of it. Thinking of purchasing a new one. Loved the watch design and structure of the machanics. This was a good buy wears well and looks great. It sturdy and light weight. This is truly a design for s male which he loves because I won’t wear it. It doesn’t go with my wardrobe. He wears it mostly in the spring and summer. My favorite watch of all time. Great quality and looks way nicer than what it costs. I like a big face watch, so note the size on the face. "A lot of the reviews say that the watch broke after a couple weeks / months of use. Are there any guarantees / warranty in case i order one and then breaks within few weeks?" Hello Pambos, we appreciate your inquiry. Overstock stands behind each of our items, please contact us if anything should happen . Thank you for shopping with us. "Is this an original? Doesnt seem to be an original piece. If so why is it so cheap? Stuhrling never made watches to be so cheap?" Hello Ashish, please be assured that this is an original piece. Overstock.com has partnerships with many leading brand name companies. Because of these relationships, we are able to buy products at low costs and pass the savings on to you. Please let us know if you have additional questions. Thanks for shopping with us. "What is the diameter of the face of this watch?" The watch the customer is inquiring about has a 44mm diameter. "does this not operate on battery like any normal quartz ?" No, it doesn''t. Automatic movement winds with the movement of your arm. It is recommended that you wind the watch every two weeks. "Where is the power reserve on this watch and how do you know when the power is getting low?" When winding the watch you can tell if there is power by how tight the crown is. However this specific watch doesnât have the power reserve indicator feature. It will last for about 34 hours without winding as written onsite. "Where can I buy a replacement strap?" We sell many different watch straps. You can find them here: http://www.overstock.com/search?keywords=watch+strap&SearchType=Header. "Does this watch come with any type of warranty? I had the watch for about a year and then all of a sudden it went dead on me." This does not come with a warranty. However, we do offer a Platinum Protection Plan.